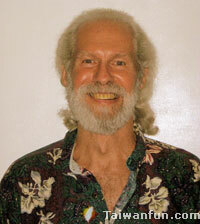 I was born in Eugene, Oregon on March 11, 1944. I began painting when I was about twelve and began showing and selling my work in the 60's. My interest in abstract expressionism began then and has continued to the present. After the death of my best friend when I was sixteen years old, I wrote my first poem. In the early 80's, I began publishing poems in journals and extended my poetry into editing, radio readings, live readings, writing groups and teaching. I lived in Anchorage, Alaska from 1984 to 1989 and had two books of poetry published there. I also painted in Anchorage, had many shows in Alaska and began focusing there on landscapes along with abstracts. Then, in 1989, I moved to Eugene, Oregon, where I took a PhD in education while continuing to paint and write. In 1998, I moved with my family to Taipei, where I currently live, have continued to paint, show and sell my work, and have published several books, including two books of poetry. 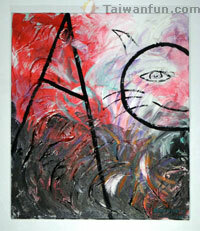 My painting, “Alley Cats,” combines the dark world of alley cats at night with the bright world of the Alley Cats pubs. Done in oils on canvas, the painting has three large color areas in black, red and white. Over these areas are quick strokes of other colors that convey the light, color and action of a fun night at an Alley Cats pub.